Greetings.This week opens with a special celebration today, Tuesday 28, at Cambodian Living Arts (Sothearos Blvd, near St 194), marking their 15th anniversary with a new retrospective exhibition looking back on its major achievements. The evening starts at 4 pm a screening of Where Elephants Weep, the CLA-commissioned Cambodian rock opera; there is an official opening at 6 pm, and a performance of traditional artforms, including Pinpeat, Mohaori and Chhayam, by a troupe of professional Cambodian artists. The accompanying exhibition, open until March 15, provides a behind-the-scenes look at 15 years of archival photos and video, including a listening station loaded with recordings by CLA artists. Also on Tuesday 28 (in English) and then again on Wednesday 29 (in Khmer), a public lecture by Phalika Ngin, at Bophana Center (St 200, between St 63 and Monivong) on identifying the faces on the Bayon at Angkor Thom. 6 pm to 8 pm. On Wednesday 29, from 9 am to 12 pm, Tim Robertson is providing a demonstration of the encaustic medium (beeswax and tree resin), and how to use it to paint or transfer images. The event takes place near Psar Chas (Old Market) in Phnom Penh. Limited space: please join the event or email timothyirobertson [insert at] gmail.com ASAP. After an astonishing ten days in Phnom Penh, the helterskelter activities of Our City Festival this weekend move to Siem Reap, where exhibitions, performances, screenings and pop-up events will stretch across the city. Check it all out at their website. Upcoming evening art workshops at Phnom Penh Community College by France Damon: Light & Shadow (Wednesday 29) and Colour (Wednesday 5 February). Register at: info [at] phnompenhcommunitycollege.com. For the imaginative photographer, Knai Bang Chatt in Kep are running a photo competition, offering a private dinner for two on the private jetty for the winner. Closing date February 28. More details here. Tuesday 28 from 4 pm at Cambodian Living Arts (Sothearos Blvd, near St 194), 15th anniversary celebrations: a new retrospective exhibition, a screening of Where Elephants Weep, the CLA-commissioned Cambodian rock opera, and a performance of traditional artforms, including Pinpeat, Mohaori and Chhayam, by a troupe of professional Cambodian artists. More info Even more infoTuesday 28 (in English) and Wednesday 29 (in Khmer), a public lecture by Phalika Ngin, at Bophana Center (St 200, between St 63 and Monivong) on identifying the faces on the Bayon at Angkor Thom. 6 pm to 8 pm. 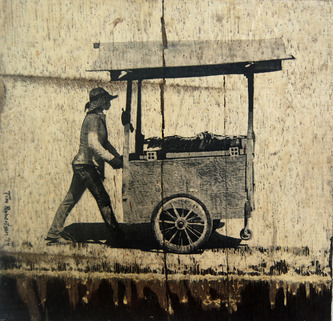 Wednesday 29, from 9 am to 12 pm, demonstration of the encaustic medium (beeswax and tree resin), by Tim Robertson. Near Psar Chas (Old Market) in Phnom Penh. Friday 31 on-going… Our City Festival this weekend moves to Siem Reap, where exhibitions, performances, screenings and pop-up events will stretch across the city. Check it all out at their website. On Friday 17, the long anticipated Our City Festival ’14 (Art, Architecture and Ideas) kicks off in Phnom Penh, with a multitude of events taking place through until Sunday 26, before heading off to new programmes in Siem Reap January 31-Feb 2) and then Battambang (Feb 7 – 9). Phnom Penh events are centred around The Mansion (cnr Sothearos and St 178, behind the FCC) and the White Building (cnr Sothearos and St 194), with pop-events city-wide. Festival highlights include: official opening featuring everything plus the kitchen sink, tuk-tuks covered in knitting, a musical cyco tour and dance flash mob, open air film screenings, exhibitions, lectures, guided tours… something for everyone? Looks like it. On Friday 17 at 6 pm in Battambang, Lotus Gallery, on St 2.5, presents the opening of The darkness of the countryside, a new exhibition by Battambang artists Nget Chanpenh and Hour Seyha. Runs until March. At Meta House on Saturday 18 at 6 pm, Kon Khmer Koun Khmer (Cambodian films, Cambodian Youth), offer a taste of this year’s annual FilmCAMp/Chaktomuk Short Film Festival, including screenings of last year’s winners, presentations and Q&A. Many local film professionals will be in attendance. From Friday 17, Our City Festival ’14 (Art, Architecture and Ideas) in Phnom Penh. Events are centred around The Mansion (cnr Sothearos and St 178, behind the FCC) and the White Building (cnr Sothearos and St 194), with pop-events city-wide. Through to Sunday 26. Friday 17 at 6 pm in Battambang, Lotus Gallery, on St 2.5, presents the opening of The darkness of the countryside, a new exhibition by Battambang artists Nget Chanpenh and Hour Seyha. Runs until March. Saturday 18 at 6 pm, Kon Khmer Koun Khmer (Cambodian films, Cambodian Youth), offer a taste of this year’s annual FilmCAMp/Chaktomuk Short Film Festival, including screenings of last year’s winners, presentations and Q&A. New Leaf Book Cafe in Siem Reap, Cambodia Dreaming, paintings by Australian artist Sonia Mattson, inspired by Cambodia and Bali. Romeet Gallery (St 178 near St 19) is hosting an exhibition by young artist Ben Thynal entitled Core – painting and installation exploring ideas around the individual and the community in Cambodian society. Runs until January 19. Tonight, Tuesday 7 is the fortnightly Spoken Arts night in Siem Reap. Write, read, sing, perform, as the spirit moves. At Siem Reap Party House on Sok San Road, from 8.30 pm. US documentary maker Robert Lieberman presents two films with Q&A at Meta House this week, on Tuesday 7 and Wednesday 8, from 7 pm. On Tuesday, They call it Myanmar: Lifting the curtain (2012) is followed at 9 pm by further Burmese related docos. Then on Wednesday, Last Stop Kew Gardens (2008), about the children of European refugees from Nazi Europe. Meanwhile, also on Wednesday 8, at 6.30 pm, Java Café and Gallery hosts the launch of Volume Seven of the Nou Hach Literary Journal, celebrating the writers and writing of Cambodia. The event will feature poetry and story readings by Chanphal Sok, Chheangly Yeng, Anna Mattsson, and other award-winning writers, plus an open mic to end the evening. On Thursday 9 at 6 pm a new exhibition opens at the Insider Gallery at the InterContinental Phnom Penh: Interpretations, by Polish born Phnom Penh resident Adrianna Snochowska (who, incidentally, was involved in the WASH collaboration last year). 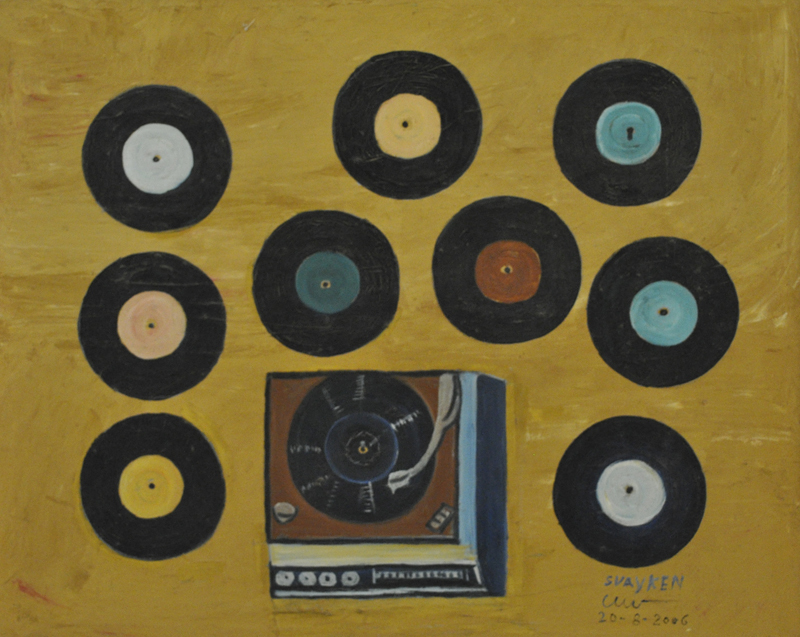 In paintings inspired by the sights and sounds of Cambodia, and the ebb and flow of music, the artist seeks to evoke both emotion and contemplation. Also on Thursday 9, the monthly Open Stage Poetry returns to Java Café & Gallery, hosted by Greg Bem. Sarah Heady and Tanya Holtland, who are visiting Cambodia from San Francisco, California, will be special guests on the night. This will be an official Cambodia release for Sarah Heady’s new book of poetry Niagara Transnational and Greg Bem’s new e-book of poetry Nine Nights in Cambodia. The reading starts at 7 pm, but writers are encouraged to come at 6 pm for the monthly writers meet-up, and to stay after the reading for the multi-lingual open mic. All styles of writing, poetry or otherwise, and in any language, are welcome. And after what appears to be a quiet weekend, come Sunday 12, why not get up early and head out to discover Central Phnom Penh by Cyclo, hosted by Khmer Architecture Tours. Reservations required, email contact@ka-tours.org. Tuesday 7 Spoken Arts night at Siem Reap Party House on Sok San Road, from 8.30 pm. Tuesday 7 at Meta House, 7 pm, US documentary maker Robert Lieberman presents They call it Myanmar: Lifting the curtain (2012) with Q&A,followed at 9 pm by further Burmese related docos. Wednesday 8 at Meta House, 7 pm, US documentary maker Robert Lieberman presents Last Stop Kew Gardens (2008), about the children of European refugees from Nazi Europe, with Q&A. Wednesday 8 launch of Volume Seven of the Nou Hach Literary Journal, at Java Café and Gallery, featuring readings and an open mic. From 6.30 pm. Thursday 9 at 6 pm, Interpretations, exhibition of paintings by Polish born Phnom Penh resident Adrianna Snochowska, opens at the Insider Gallery at the InterContinental Phnom Penh. Until February 8. Thursday 9 the monthly Open Stage Poetry at Java Café & Gallery, hosted by Greg Bem, featuring Sarah Heady and Tanya Holtland. The reading starts at 7 pm. Monthly writers meet-up from 6 pm; multi-lingual open mic after the reading. Sunday 12 Central Phnom Penh by Cyclo, hosted by Khmer Architecture Tours. Reservations required, email contact@ka-tours.org. 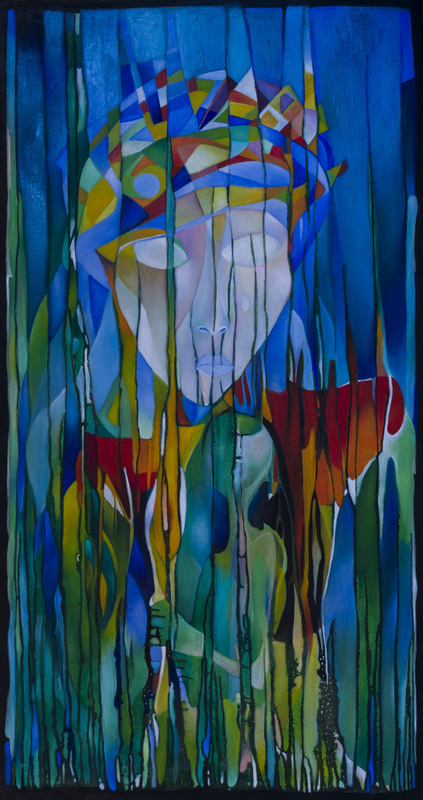 Secrets, new paintings by Oeur Sokuntevy, at Java Café and Gallery. Until January 12. Rik Reay Gallery and Noodle Shop (St 178 near St 19), Our Books exhibition My New Year’s Resolution, featuring works by Tek Tevin, Sin Yang Pirom, Sao Sreymao, Moeu Diyadaravuth, Chan Pisey, Kong Monirath, Peou Ty, Prum Vannak, and Pal Poursith, with colors by Kim Phally. You can also see the entire set as a feature on Khmer Connection. Contemporary Khmer comic artists to present NEW thoughts, resolutions, reflections, and aspirations. Until January 21. Greetings and welcome to the international new year of 2014. Kumnooh is pleased that even in a such a quiet week there’s still fresh and exciting things to report. Opening today, Wednesday 1, and running for three weeks at the Rik Reay Gallery and Noodle Shop (St 178 near St 19), is the Our Books exhibition My New Year’s Resolution, featuring works by Tek Tevin, Sin Yang Pirom, Sao Sreymao, Moeu Diyadaravuth, Chan Pisey, Kong Monirath, Peou Ty, Prum Vannak, and Pal Poursith, with colors by Kim Phally. You can also see the entire set as a feature on Khmer Connection. 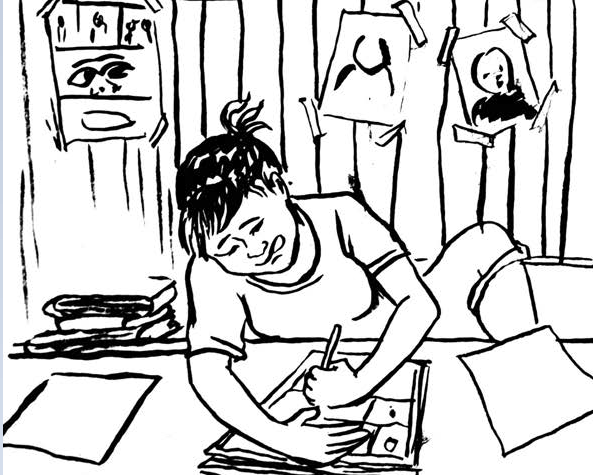 Contemporary Khmer comic artists to present NEW thoughts, resolutions, reflections, and aspirations. Fancy a little poetry? Expat scene-buster Greg Bem has speed-published an ebook online, Nine Nights in Cambodia, for free download. Check it out here. Greg has already been bring newly written pieces along to the Java poetry open mics in recent months, and we look forward to hearing more. In the meantime, we can read. paintings by Australian artist Sonia Mattson, inspired by Cambodia and Bali. This Dog Barking, a selection of works from the graphic novel by Nicolas C.Grey and James Farley, at Lotus Gallery in Battambang. Until January.